Each producer gets five free packaged CD sets of their work with cover art, distribution to all online vendors including Amazon, Barnes & Noble, WalMart, and libraries, as well as full marketing and promotion services, and 50% of all retail sales. 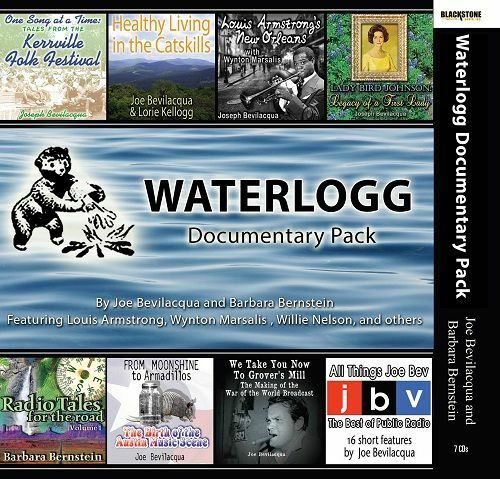 One of the many successful Waterlogg audio collections featuring Joe Bevilacqua. NAPANOCH, N.Y. - May 20, 2014 - PRLog -- Waterlogg Productions announced today the new Public Radio to Audio Book Program, a service designed to assist under-distributed public radio producers sell direct-to-listeners distribution. "We are happy to offer this service at no cost to the public radio producer" says Waterlogg Productions founder and veteran award-winning public radio producer Joe Bevilacqua. Bevilacqua is among the few public radio producers who has successfully transitioned to the digital and audio book landscape of the 21st Century, releasing over 120 audio titles through Blackstone Audio since 2009. The current Waterlogg audio catalog encompasses every style of audio storytelling, including traditional readings of fiction and non-fiction published books, new full scale audio theater productions, and compilations of Bevilacqua's 40 plus years in public radio. Each producer chosen gets five free packaged CD sets of their work with cover art, distribution to all online vendors including Amazon, Barnes & Noble, WalMart, and libraries, as well as full marketing and promotion services, and 50% of all retail sales. Bevilacqua explains, "Our Public Radio to Audiobook Program is for producers who have tried and failed or are unhappy with the level of their success. Our partners understand clearly we are giving them something they cannot do on their own." Public radio producers may submit their work by emailing info@waterlogg.com, with the name, a short description and length of the show or series. If chosen, shows will be delivered via Dropbox. Joe Bev also creates 34 hours of audio podcasts every month, under the collective title of The Joe Bev Hour, airing on radio stations around the world, podcast at iTunes, Tunein.com (http://tunein.com/search/?query=Joe%20Bevilacqua) and via SmartPhone at http://waterlogg-productions.mobapp.at/. Bev also programs ten monthly hours for The Bear Manor Radio Network streaming at http://www.bearmanorradio.com. It was announced on May 13, 2014, Joe Bev podcasts had surpassed 100 download per day - up 862% since September 2013. The Camp is preparing for a big birthday bash for former Camp Waterlogg owner, Uncle Goopie who is now a hermit in a cave who only comes out once a year on his birthday. Uncle Goopie is played by Bob Camp, co-creator of Ren & Stimpy. Host Joe Be presents part two of a tribute to Bob Clampett's "Time for Beany," featuring Stan Freberg and Daws Butler, Bill Marx (author of "Son of Harpo Speaks") talks about his dad's favorite children shows, "Clyde Crashcup Invents the Bathtub" with Shep Menken (1961), Pebbles and Bamm Bamm sing Let the Sun Shine In (1965), part four of "Willoughby and the Professor Meet Bartizan the Genie," (1975), Daws Butler teaches Joe Bev how to be a voice actor, part four (1975), and Uncle Dunkle and Donnie in "Perky the Pig" (2009). In Homeland-Security-Comes-to-Camp-Waterlogg, Ranger Joe Bevilacqua and Ranger Lorie Kellogg improvise radio theater stories, doing most of the voices themselves, from their cabin in Catskill Mountains. This week, the chipmunks and squirrels are throw nuts and acorns at the staff and visitors at Camp Waterlogg. Chef Ron Drysdale is still missing and now Adam Maxwell (Joe Bev) from US Homeland Security is look for him. Joe Bev also plays Sgt Lefty, Ellis da Boatkeeper, Woody, Adam Maxwell and Lil Orphan Andy. Kellogg is also heard as Lkie, Elise and Mrs. Terwilliger. Plus, the audio cartoon "Reddy Robin and the Owl" by Daws Butler, and more.